We all know that ﻿﻿﻿﻿﻿﻿jazz is a unique and intricate genre. It is a musical field that not anyone can transcend or thread. It requires dedication from the player, especially that you have to learn its sophisticated fundamentals. However, aside from the required skills, an interested individual should also invest on the best jazz guitar. Since this is a special field, it has to receive a special treatment, too. And honestly, I am not just sugarcoating my words here. Jazz, if played on ordinary electric guitars, would be that warm and soulful. That's why guitar giants like Ibanez and Gibson have been grinding their gears to ensure that they can create instruments that can cater this genre. Jazz guitars are just like metal guitars and blues guitars. Each of them has specializations and innovative designs that further solidifies their performance to their given genre. As you progressing your skills as a guitar player, you will realize that a single electric guitar is not enough. Sooner or later, you will wake up wanting an instrument that can accommodate the genre or style that you want to master. Fortunately, the market today is not lacking when it comes to jazz guitars. In the past, getting a jazz guitar is like selling your soul. An authentic jazz guitar can cost more than $10,000. Because of such, only professionals and collectors were the only one who can acquire this instrument. But the story is different now. The market is teeming with options that even an average player like you can enjoy. Get to know the best ones here! One of the best options you have for a jazz guitar is the Godin 5th Avenue Kingpin P90 Jazz-Style Acoustic Electric Guita﻿﻿r. I can testify that this guitar is among the exceptional units out there that can produce soul-rendering sound and performance. It comes with an archtop body, which ensures you that it is a guitar made for jazz. Specifically, the Godin 5th ﻿﻿Avenue is using the 1950 archtop body model. It is a classic vintage, but its quality still endures the test of the time. The prowess of the instrument is there, and it is not lagging when it comes to playability. This jazz guitar has allowed the past to meet the present. And as jazz players, we all love to hear to such nuance. The technical features of the Godin 5th Avenue feature high-quality volume production, which is deeply focused on the low and mid frequencies. The tone it produces is warm and dynamic, too. Because of such capabilities, the guitar can improve the sophistication of your playing style. Meanwhile, its construction is not shabby, as its body is made from the Canadian Wild Cherry. Its top and back have molded arched design. The sleekness and functionality of the Godin 5th Avenue are something that you should not ignore. It can provide the presence and articulation that you need every time you are playing jazz songs. And since this tool doesn't have a hellish price, investing in this jazz guitar would be a wise decision--day in and day out. An original of Epiphone, the Epiphone WILDKAT is another jazz guitar that anyone would love to invest. This is an excellent alternative to the Godin 5th Avenue if you find the latter too expensive for you. It comes with a vintage design and sound that can undoubtedly pique the interests of jazz players. Despite being a classic, this jazz guitar is never hard to play. It is beginner-friendly, and most of its ergonomics can suit the preferences of amateurs. The quality of the Epiphone WILDKAT is primarily attributed to its selection of tonewood. It is using a mahogany body that has been further developed to gain better sustains and warmth than ordinary mahogany construction. The body is computer-routed, too, which allows the guitar to have the traditional acoustic guitar design. This Epiphone WILDKAT also features a genuine mahogany neck for enhanced sustains, tone, and volume. There is no question of its sonic versatility either, as it comes with Bigsby B70 vibrato and rosewood fingerboard. You can smash those chords and notes without worrying the sound it creates. After all, it comes with a pair of P-90 pickups, which is a classic product of Epiphone. All the essential controls to make the instrument bang are all included on the guitar. The main control that it has offers configurations to neck volume, bridge volume, master volume, and master tone. All these settings are operated by the patented 500k potentiometers of Epiphone. The Epiphone WILDKAT also comes with a sturdy output jack and toggle switch made from authentic metal. The Yamaha Pacifica Series PAC12 Electric Guitar is the best route if your budget is not that generous to you. It can be a decent option for anyone, especially for beginners and curious players who want to explore the world of jazz. Despite its affordability, I can still say that this instrument still remains a great option. It is among the entry-level jazz guitars that you shouldn't miss. If we will just base our qualifications on appearance, the Yamaha Pacifica Series PAC12 Electric Guitar would certainly fall. After all, it has a bland and generic electric guitar look. Fortunately, such factor doesn't determine the overall quality of this instrument. The construction is impressive, and all the parts have been carefully selected. 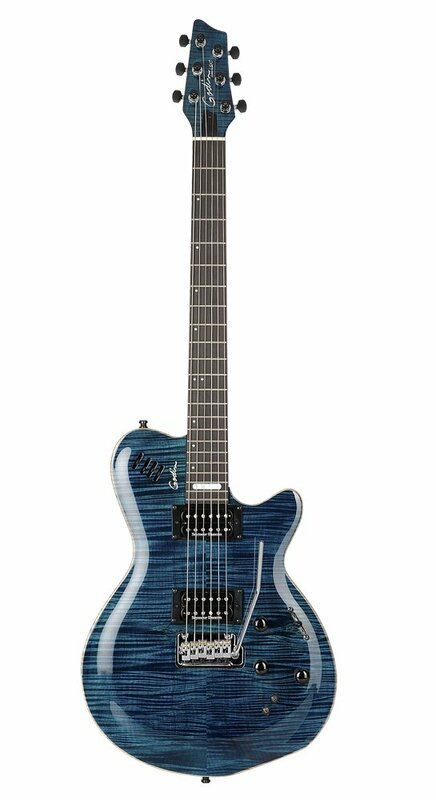 The body of the Yamaha Pacifica Series PAC12 Electric Guitar is made from Agathis body, which is a great tonewood. Although it doesn't have the same depth and presence as mahogany wood, Agathis is still a remarkable guitar body material. Meanwhile, it comes with a Sonokeling fingerboard and bolt-on neck crafted from Maple wood. The electronics of this guitar have surpassed my expectations as well. The vintage tremolo and 5-position switch that it has enables the instrument to play smooth and articulated sounds. It got nice sustains with only minimal distortions present. I can also testify that its playability is something that you should look forward. Aside from jazz, it can also cater other genres, especially rock and country songs. I have to emphasize that some jazz players will never consider this one as a high-end piece. After all, most of the premium jazz guitars are already sitting at the $20,000 value or more. However, for the average players like you and me, this is already a wonderful instrument to yield. The construction and design of this guitar can guarantee you that the money spent for it are all compensated. This Canadian-made guitar was able to survive the tough competition with its consistent quality and performance. The Godin LGXT features a cutaway body made from maple and neck from Honduras mahogany. This particular selection tonewood solidifies the articulation and presence of Godin LGXT even live concerts and performances. It is distinctly warm and clear, which can awaken the souls of jazz lovers. The overall hardware design of the Godin LGXT is brimming with excellence. The distinct setup of the ax proves that it this unit can raise the standard of the competition. Just by looking at its headstock alone, I can't help but feel that this guitar is flawless. It also has a proprietary RMC X-Bridge which optimizes the tremolo system that it has. Meanwhile, it also has an RMC preamp EQ for enhanced control of the midrange and bass frequencies. It is notable that the true game-changing quality of the Godin LGXT is its dual humbuckers. Specifically, it has an SH II Jazz pickup positioned on its neck and a separate Custom III on the bridge. This design has been improved more by the integration of a 5-way switch. This opus from Godin can emanate clear and low tones. If you want to play jazz, such capability should be good news for you. The Epiphone Broadway Classic is among the longest running guitar series on the market today. It is an archtop guitar that has been serving the jazz industry for more than 80 years already. The tone that it has is classic and timeless, with all the clarity and articulation still on the roll. I should inform you that this aesthetically appealing instrument sets the bar for jumbo jazz boxes. It is also considered as one of the biggest boxes in the modern market. Specifically, it measures around 17 inches from the lower bout. Because of this impeccable design, the range and volume of this guitar are peerless. It is the perfect choice for making jazz masterpieces without trying too hard. The Epiphone BROADWAY Classic is a cousin of the Epiphone Emperor Regent. Therefore, their archtop body design was derived from the previous skirmishes that it has with Stathopoulos and Gibson. It has been renovated and reinvented until its current quality is finally achieved. This guitar has been one of the top choices for many jazz professionals such as Nick Colionne. From its hardware down to its electronics, the Epiphone Broadway Classic is never out of shape. The entire body is made from maple while its top is crafted from spruce. It also features the highly acclaimed Alnico Classic Humbuckers that can generate optimal jazz tones regardless of the application. All the necessary controls are present, too, such as the neck volume and bridge tone. By just looking at this instrument, it is pretty obvious that the Ibanez Artcore AF55 Hollow-Body Electric Guitar is not just for show. It goes beyond its aesthetics, which is already a deal-sealer for me. This guitar features an authentic maple construction to its full hollow body. Because of such setup, the guitar can provide impressive resonance that never generates any feedback at all. Versatility is among the best traits of the Ibanez Artcore AF55. Aside from the mesmerizing jazz tones, it can also be used in creating masterpieces in the field of punk, rock, and metal. It has admirable sustains and great articulation. The sound that comes out from its amp is clear and doesn't suffer from any delays or distortions. The presence of the ACH-ST humbuckers on the neck and bridge enables the guitar to create beefy yet silent signals. Also, this instrument is much focused on the mid and low frequencies. If you want to play bright sounds, this one is not the best choice for you. But since we are talking about jazz here, I am pretty sure that you are craving for this beast already. Any guitarist has the option to get a jazz guitar or not. A guitar player can survive and be good in the field even without investing in this unit. But for those who want to cover all the musical areas, there is a necessity to get this instrument. Of course, this is not an easy decision. After all, jazz guitars are fairly expensive compared to standard electric guitars. These guitars have a special build and circuitries that allow them to play as they should be. Because of these specific innovations, jazz guitars tend to be placed on the higher end of price spectrum. Despite this, the market today is being overwhelmed with different design and units of jazz guitars. It is just proof that guitar players nowadays are not reluctant anymore to get what they want. If it is you are a first-time buyer of jazz guitar, you might get a little confused about what to choose. As early as now, I have to be blunt about you that the considerations in choosing a jazz guitar are way different from the factors that indicate a good electric guitar. Therefore, you should pay attention to the details of the instrument. Otherwise, you will never get a jazz guitar that can fulfill your soulful needs. But don't fret. You don't need to go anywhere just to get an instrument that can embody your passion. I have listed all the essential elements here that you should be aware of when you are going to buy a jazz guitar. Let's make them roll! Most of the guitars that have solid bodies are typically used by players in the country, blues, and rock genre. These are the mainstream usages of the solid body guitars. But if you go to some recluse places and communities, you will see a handful of jazz players using this type of guitar. I can name a few notable players who used solid guitars when playing jazz. Such of these are John Abercrombie of Ibanez and John McLaughlin of Gibson. Even Mike Stern is using Yamaha or Fender version of Telecaster when playing smooth jazz. Guitars with solid bodies are notorious for their consistency in tone production. They have a strong and compelling volume, too, which allows the player to the stand out in the mix. Because of these traits, solid body guitars are less susceptible from being exposed to feedback. Such is a necessary feat if you are recording or playing live gigs. Guitars that have this body type are considered as the "in-between" options. You will notice that semi-hollow guitars are not as small as solid body guitars. However, they are no bigger than archtop guitars as well. That's why they are sort of in the middle of the classification. Notably, semi-hollow guitars are known to suffer from feedback problems. However, they can still offer good perks, too. If you are a jazz player, you might want to consider this type of guitar first. Among all the body styles, this one offers the best soothing tone, which is necessary for any jazz songs. They are more flexible and playable, too, compared to their archtop and solid counterparts. I have known some popular guitar players who have a deep inclination towards semi-hollow body guitars. Such of these are Larry Carlton, Ben Monder, and Emily Remler. These guys have taken the instrument to a whole new level! Despite the impressiveness of semi-hollow guitars, it is still the archtop guitars that sit on the top when it comes to jazz guitars. It has always been the icon of the industry, proving that its quality can transcend the continuous change in the music industry. Throughout the history, multiple jazz legends were seen to use archtop guitars. Some of them are Joe Pass, Wes Montgomery, and Johnny Smith. Contemporary players have also take a liking over archtop guitars. Mark Elf, Craig Wagner, and Russell Malone are among the new young blood that continued the legacy of jazz music through the help of this instrument. Specifically, archtop guitars have two classifications: the one that is used for performance and the one that is bought for collection purposes. High-end archtop guitars have whooping prices. The normal price of these collectible guitars can range from $20,000 to $30,000. Of course, you should never invest on these instruments if you haven't mastered the art of playing jazz. Only professionals have the guts to take them on. Fortunately, brands like Ibanez, Gibson, and Gretsch are trying their best to ensure that ordinary players like us can acquire decent jazz guitars at an affordable price. Jazz is a complex and highly advanced genre. It is not something that you can learn from the first months of years you have played the guitar. It takes time to master it, and you probably need an instrument that can support you on taking on the learning curve. A jazz guitar should not only be great-sounding. It should be comfortable, too. Always have a good grip on the instrument that you want to invest. See and feel if the entire guitar body feels good in your hands, fingers, and posture. You should be able to clutch all the chords without facing any nuisance. It is not enough that you read reviews and guides like this. Although what I am saying is true, this doesn't mean that your preferences and options don't matter anymore. That's why I always encourage my readers to try the guitars by yourself. You should be able to hold and play them. By doing this, you will know how playable and ergonomic the guitar is. We can experience different things on a single guitar. Not all that I can notice and observe can be taken and accepted by you. I may say that I don't this particular design, but you always have the choice to refute it. And the best way to do it is trying the guitars that are on your selection list. One of the most critical aspects of any guitars is the tonewood. Since time immemorial, the choice of wood is already an important consideration. A guitar can never be good as long as the tonewood used to it is flimsy or inappropriate. Tonewoods are essential for the operation of the guitar. With a good wood, the instrument can create highly rich tones and extra long sustains. Jazz players tend to be picky when it comes to the construction of their guitars. They are quite interested in the hardware specs of your guitar, which could even include the makes of your tuners and headstock. Since we are talking about jazz guitar here, I recommend that you should get those units that have either mahogany or maple body. They are semi-heavy, but the sound they produce is warm and long. For the jazz genre, these are the qualifications that you should meet. The best jazz guitar is not a staple instrument for the average guitar players. I have already conceded to such fact already. But for players who are hooked to such genre, these instruments can appear like their holy grail. Jazz guitars are not easily found, especially in online markets. Therefore, it would be great if you can try out a particular guitar by yourself. Otherwise, you will never get the right one for you. I have made some recommendations in this article. For example, those units that came from Godin such as the Godin 5th Avenue Kingpin P9﻿﻿0, exhibit beautiful sound production and matchless performance. This will give you a realization that jazz guitars today have already a hold on the industry. Without them, the entire jazz community would suffer and lose their souls somewhere. Was this article helpful? If you have some other questions or recommendations, feel free to ask me in the comment section below!